Such concepts certainly help to elucidate Pound’s practice, but other considerations are also relevant – the clustering and placement of Beats within a line or rhythmic set, for example. Heavy emphasis is gained by invoking grammatical and contrastive stress, pre-modification, and compound words. Compounds are particularly important, especially when placed either at the beginning or end of a line. Both parts of a compound are normally stressed, but the second syllable somewhat less so [–s]. In the case of monosyllables, the effect is that of a dying fall. That phenomenon is taken for granted and will not be marked in the selected scansions attached. Should the last word in a sequence of uninterrupted Beats at the end of a line be di-syllabic and stressed on the first syllable, the subtlety of the rhythm is further enhanced. When such a set begins with a Beat, the effect is even stronger. David Moody noted that at the beginning of his career Pound “studied Dante’s metre and discovered how his hendecasyllabic line was made up of a combination of rhythm units of various shapes and sizes.” | 7 | Virgil had also done the same and Pound continued the tradition. In The Cantos, tension between taut rhythms, which have more Beats than Offbeats in a set, and those which are slack (reversing the ratio) also create a dynamic force. The slack units can either approach or even achieve traditional tri-syllabic meter, sets in which the number of pulses are at least double that of Offbeats. 7 | Ezra Pound:Poet, Vol. I (Oxford; Oxford University Press, 2007), p 60. Such ratios are, more often than not, imperfect in order to underscore those occasions when an exact balance is established. At other times the 2B set functions as a refrain or flourish which comments on preceding subject matter. Depending on grammar, such patterns may elide rhythmically with antecedent or subsequent sets. In many cases it completes itself by repetition later on. On the other hand, an extension of line length creates the sense of a more relaxed momentum, and the natural pauses between phrases (juncture), cause them to be registered segmentally. The effect lends itself to both lyrical and prosaic modes, depending on subject matter and sound patterning. Whether one registers such a line as a whole or as discreet rhythmic sets is a question of individual perception and interpretation. Space does not allow showing an alternative syllable count, but throughout this presentation, juncture has been taken to indicate the end of a rhythmic set. The proposal to change position of line divisions etc/ [in setting type for Rock-Drill] arouses IN-dig-nation. 8 | Published with the consent of Mary de Rachewiltz. Poudistas tend to fuss over-much about the exactness of line indentations. In all known witnesses, compositors simply regularized Pound’s rough indication of rhythmic intention. The vigor with which he slapped a typewriter carriage was never uniform, and printers, quite rightly, adopted a reasonable norm: multiples of standard tabulation and visual accuracy for ‘dropped’ lines (those which align themselves with the end of a preceding text). A few picas more or less really doesn’t make a whole lot of difference. 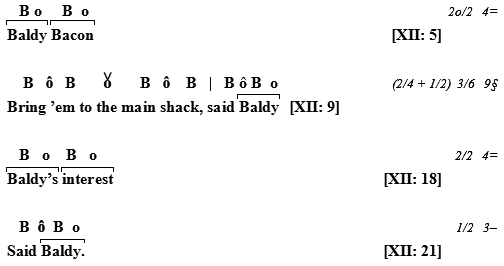 Other fault lines locate themselves along the unintended run-over lines caused by page width and the obfusction of stanza breaks when they coincide with page endings. The present, New Directions, version never aspired to exactitude, any more than had earlier printings, but with the exception of XXXVI and LXXXI, remains reasonably acceptable. Worrying over leading (interpositions by compositors of base metal) which justify the lower margin of printed pages, is equally absurd, and there is no earthly reason for reproducing the base text photographically. In the same vein Greek accents are not always accurate – nor even consistent. The use of single quotation marks for ‘spiritus asper/lenis can hardly be defended, nor opening single quotation marks for apostrophes in Romanized Chinese. The only reasonable point of reference is presumed setting copy and common sense.